Ruby is famous for being easy to learn, but most users only scratch the surface of what it can do. 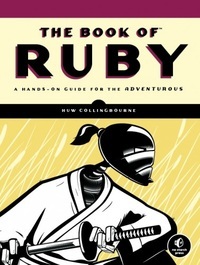 While other books focus on Ruby’s trendier features, The Book of Ruby reveals the secret inner workings of one of the world’s most popular programming languages, teaching you to write clear, maintainable code. Each chapter includes a “Digging Deeper” section that shows you how Ruby works under the hood, so you’ll never be caught off guard by its deceptively simple scoping, multithreading features, or precedence rules. Whether you’re new to programming or just new Ruby, The Book of Ruby is your guide to rapid, real-world software development with this unique and elegant language.